The Australian music industry took massive leaps forward during the 1970s. Bands like Daddy Cool opened the gates early in the decade for Australia’s golden age of rock. 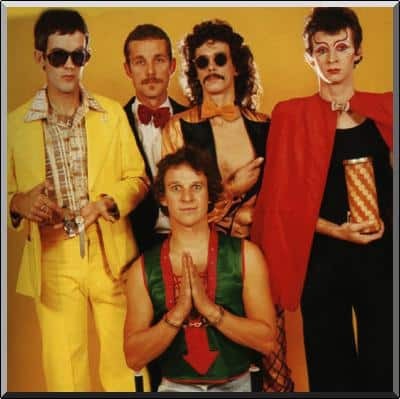 Skyhooks formed in 1973 and were kings of the Australian music scene two years later. The band’s outrageous visual style was the perfect match for the popular music television show Countdown. They were instrumental in saving their record label Mushroom. This label went on to be responsible for releasing many famous Australian acts of the 70s, 80s and 90s. By 1980 the band folded after releasing five studio albums but reformed many times for tours over the next decade. They returned to the studio in 1990 and had a number 1 single with “Jukebox in Siberia”. An attempt to return to the studio to record an album in 1993 was shelved, later being released as a bonus disc accompanying greatest hits collection. Here we discuss what you as a musician can learn from Australia’s first pop supernova Skyhooks. At the time this album was the highest selling of all time in Australia. The mood is instantly set by the exciting opening lead guitar lick of “Living in the 70s”. The catchiest set of guitar riffs set to vinyl in Australian pop history are accompanied by clever guitar harmonies. Sales were assisted by a radio ban on 7 of the 10 tracks from the album. The lyrical content of local Melbourne references with the social context was unique. Through the attention to detail by producer Ross Wilson of Daddy Cool fame, every track on this release the masterpiece in Australian history. A must have for any Australian rock music fan. Guitarists learn “Living in the 70s”. Bass players learn “Whatever Happened to the Revolution”. Learn to play the song “Carlton” from this album on guitar in this tuition by ESSM teacher Rhys Lett. Skyhooks quickly followed up with the equally successful Ego Is Not a Dirty Word album. It spent 11 weeks at number one of the album charts. It contains some of Skyhooks’ best musical passages on songs like “Ego”, “Love’s Not Good Enough” and the Symonds written “Every Chase a Steeple”. The perfect companion to Living in the 70s this is another must own for any rock music fan. Guitarists learn “All My Friends Are Getting Married” solos. Bass players learn “Love’s Not Good Enough”. Drummers learn “Ego is not a Dirty Word”. Learn to play “Saturday Night” from this album on guitar by watching this tutorial. Skyhooks signed an international recording deal after the success of the previous albums. Recorded in America and Australia after a long stretch of touring. The album opens with the cracking “Million Dollar Riff”, their best single release. With a few filler tracks it is not as strong as the perfect first two albums. It still contained four very strong singles and maintains the humorous look at the world at the time. Guitarists learn “This is my City”. Bass players learn “Blue Jeans”. Drummers learn “Million Dollar Riff”. Guitarist Red Symonds left the band before the recording of this album, replaced by Bob Spencer. The Skyhooks sound also changed on this album as they attempted to crack the international market. This is also the heaviest album in the catalogue with Spencer adding a hard rock guitar style to the band. Songs range from brilliant to dreadful. The high quality of musicianship maintains. Guitarists learn “B B B Boogie”. Learn “Women in Uniform” on guitar in this lesson taught by Rhys Lett. Singer Shirley Strachan left before this album was recorded replaced by Tony Williams. Even for the biggest Skyhooks fans this album is a tough listen. Written under difficult circumstances of new band members, trying to catering to an international sound while also pleasing the Australian fan base. If released under a new band name it may have been easier to find an audience. A curiosity more than a necessity.